Catherine Paplin had no web presence and she wanted a simple web site that is representative of her services but can grow to accommodate modules in the future. The website is completely content-driven. Users can log in and manage the menu, pages and the content including images and video. 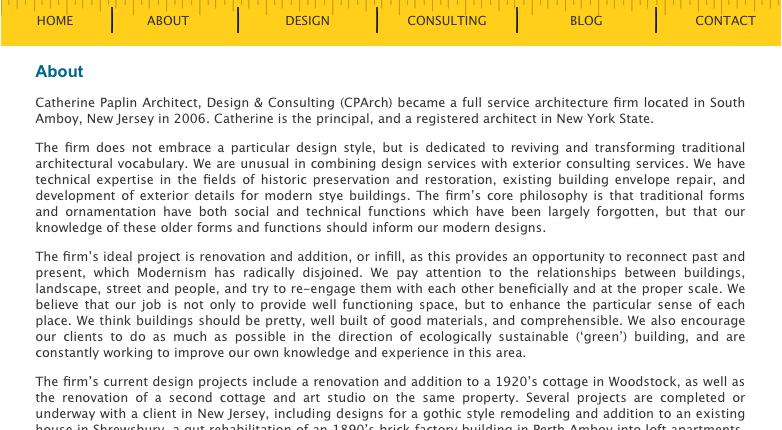 Catherine Paplin Architect, Design & Consulting is a full service architecture firm located in South Amboy, NJ, practicing in the greater metropolitan area of New York and New Jersey, as well as upstate New York. Send us a note with your requirements and we’ll get in touch with you shortly.